Offered is a set of three newly painted mid century modern Russell Woodard "Arnold Palmer Collection" wrought iron oversize side table/dining table with center hole for umbrella and two matching rocker base armchair. We have painted the set in a deep Hunter green; however, we can paint in almost any color for a small up-charge. The table measures: 48" D x 24.5" H. Matching drink's trolley / bar cart is available. Very good newly painted vintage condition with no rusting. 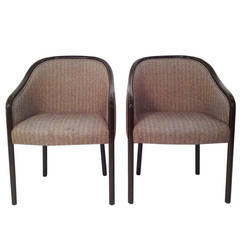 Designed by Herbert Saiger for Woodard & Sons, these polished to a perfect shine armchairs have been restored beautifully.